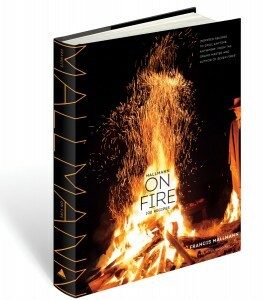 Photographs by Santiago Soto Monllor, from Mallmann on Fire by Francis Mallmann (Artisan Books). Copyright © 2014. Here’s another of our ongoing guest recipe series featuring some of the world’s top grill and smoker masters—this one by Francis Mallmann. Argentina’s most celebrated chef can sauce and sauté with the best of them (after all, he trained with Alain Senderens and Raymond Oliver in Paris). But Mallmann staked his reputation on a venture so outlandish, only a fire-obsessed South American could bring it off: he once taped an entire TV show based on campfire cooking entirely outdoors on a Patagonian glacier in winter. Chef, restaurateur, TV personality, author—Francis Mallmann enjoys superstar status in South America, and when it comes to roasting a whole steer in front of a bonfire (hint—you need a hydraulic winch to raise it) or serving the South American jet set on damask linens at one of his restaurants, this poet-, musician- and carpenter-turned chef is your go-to guy. I adore dissonance in food—two tastes fighting each other. It wakes up your palate. Don’t be afraid of burning your food. The right amount of charring or burning adds an extra dimension. The element of danger and excitement appeals to me. Take burning too far and it destroys the dish. Stay just this side of the line and it’s lovely. Pay attention to the wind direction and always position your dining area upwind of the fire. You should also keep your ingredients out of the path of the smoke, which can give your food a bitter taste. Most of the steaks on this blog are direct grilled over a charcoal or wood fire. Mallmann takes a radically different approach, searing a monster cowboy rib eye, not on the grill but on a plancha (cast iron slab). This gives you a rich crisp crust and beef as tender and rare inside as you could wish for. Add grilled dates and a crispy brioche salad and you’ve got a meal that will revolutionize your notion of steak. 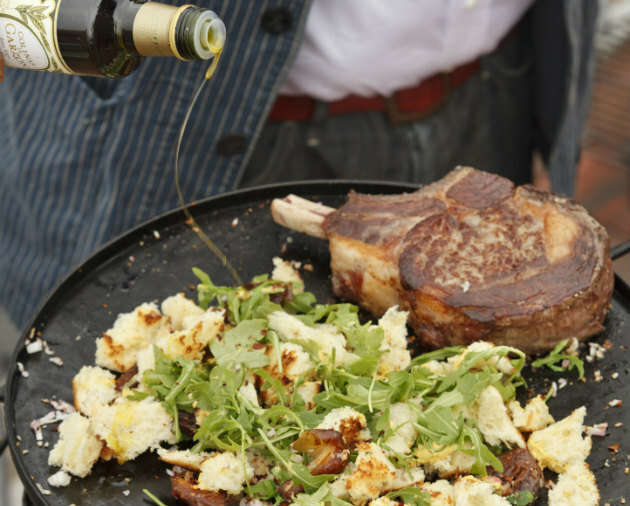 Get the recipe for Cowboy Rib Eye a la Plancha with Crispy Brioche Salad and Grilled Dates. Also check out the cast iron chapa or plancha, one of Mallmann’s favorite grilling tools.